One of the downsides that you may experiencing during your cloth diaper adventures is leakage. I am sure that you are not wanting to read this right now if you are a cloth diapering mama. It is however a reality. While it can be a downer there are ways to prevent this from occurring. 1. Prewash diapers several times (3 times minimum) prior to first wear. Use very little detergent since these are new diapers and are not being washed because they are dirty. You just want to be sure that there are no residue left from the production of the diapers. 2. Choose the right diaper size and fit. Diapers should fit snugly both around the waist and thighs. 3. Ensure prefolds are correctly folded. For boys more coverage is needed in the front whereas for girls more coverage is needed in back. 4. Select the correct inserts if using pocket diapers. Inserts should cover the full width of the diaper but no wider than this. Being overly wide will cause the seams of the diaper to stretch making the insert bunch up and pull away from the sides of the diaper when baby moves. 5. Wash the right amount of diapers in one load to get clean diapers. Diapers should be able to rub together in the wash cycle as a way of rubbing against each other to get clean. Also, too many diapers can take up too much room not leaving enough space to allow diapers to agitate. Diapers that are not cleaned efficiently will leak. 6. Use the correct amount of laundry detergent. You want just enough to do the job. Overuse can lead to build up after time thus resulting in leakage. 7. Use an adequate amount of water to ensure that there is no residue left behind from detergent. Detergent left behind will cause build up after time resulting in leakage. It may be necessary to add an extra rinse cycle to your wash routine if your machine does not use enough water to rinse out the detergent. I found this to be especially the case with front load machines. 8. Avoid using any fabric softener liquid or sheets. Liquid fabric softener can leave a residue in your washing machine which can cause a build up in your diapers. Instead use vinegar which doesn't leave build up behind. Fabric softener sheets can cut down on the absorbency of diapers. 9. Do not place diaper covers in a heated dryer. Diaper covers exposed to high drying temperatures may become worn over time and no longer waterproof. Instead dry covers on a rack or a line outside. They take very little time to dry anyway. 10. Make sure to change diapers as required. Do not wait until the diaper is completely saturated after several hours. 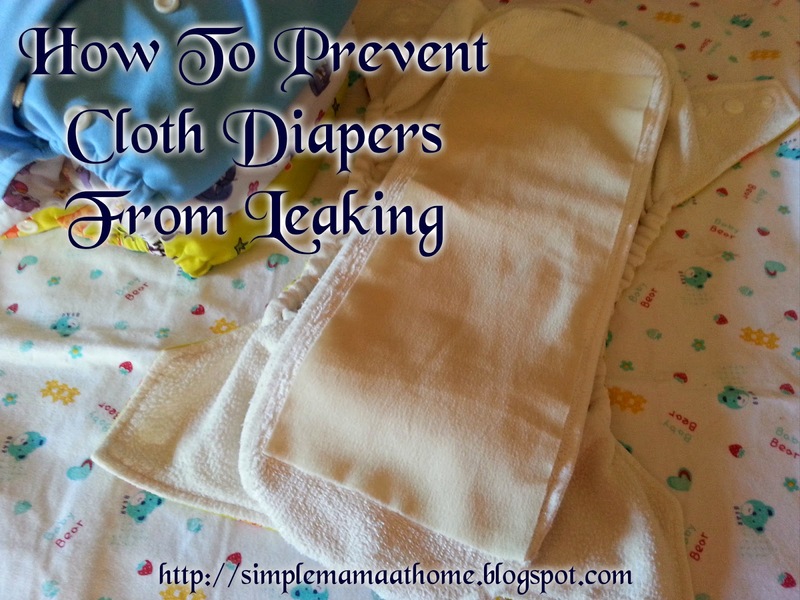 I hope these tips have been helpful to anyone having issues with cloth diaper leakage. Remember cloth diapering is by trial and error and takes time to get familiar with it. Wish you all the best in your diapering adventures! What a wonderfully useful post! My babies are now teens, but I remember "those" days quite well! Thank you for sharing at the Merry Monday Link Party!